There's so much more you can do to get well! Few, if any, Chiropractors have over 35 years experience. 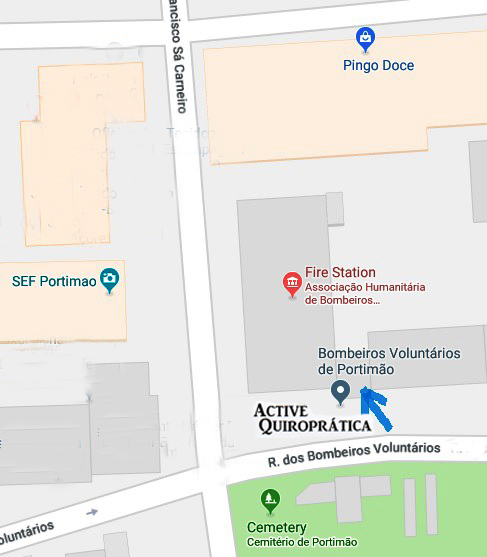 Dr. Bock's experience includes: Chiropractic orthopedics, injury rehabilitation, Shoulder Expert, auto/work injuries, Chiropractic teacher, working alongside medical doctors and surgeons, etc. There are very few Chiropractors who work to get you well quickly (most push "lifetime treatments"). Your quick recovery is Dr. Bock's goal for you! 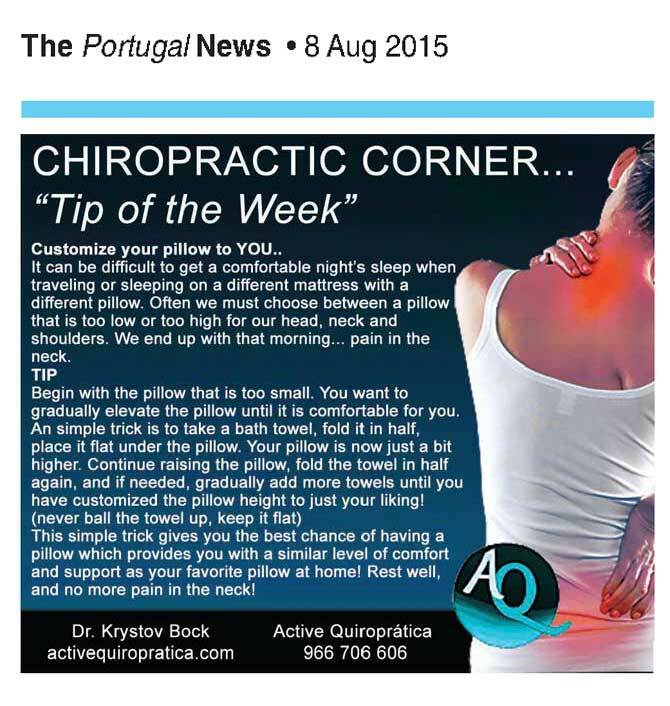 But there is only one Chiropractor in Portugal who is all three! No other Chiropractor has 35+ years of experience as a Shoulder Expert & Spinal Disc Decompression as does Dr. Bock. Many patients fall asleep during their treatment! Dr. Bock ---"The Shoulder Whisperer"
Dr. Bock is a world leading expert on shoulder recovery. A recent study found that 22% of all people have a tear in their shoulder rotator cuff muscles. Another study found that 50% of those people also have a tear in the opposite, non-painful shoulder. Which means: the opposite shoulder is just a minor injury away from a full-blown problem! It is very common for the non-injured shoulder to begin having a problem within 18 months. While working as an Olympic Chiropractor, Dr. Bock specialized in fast shoulder recovery. instead of the usual 6 months treatment time. This gentleman wasn't able to lift his left arm above shoulder level for 3 years. 6 minutes of Treatment... arm straight up, NO pain. Why is Dr. Bock "The Shoulder Whisperer"? Treatment is completely Pain-FREE. Nothing is forced. 93% of patients experience better movement in just a few minutes. Dr. Bock offers you a FREE Consultation and Exam to see if you can recover quickly! His revolutionary procedure gently allows your shoulder to move freely again. As the muscles relax, you begin to have pain-free movement. Healing quickly begins. Dr. Bock has simplified the process so your shoulder can once again move normally. Treatment is gentle and relaxing. It is vital to seek care immediately once you begin to have a problem before it progresses to adhesive capsulitis. Adhesive capsulitis is a severe painful binding down or "gluing" of the internal shoulder joint. Many people must undergo corrective surgery, don't let this happen to you. Call us Today and get back to your Active life! "A Chiropractor that wants his patients well"
"Dr. Bock worked carefully with my sciatic nerve problem. He stretched my lower back, treated it with relaxation technique and then advised me to do certain types of exercise. He did not do adjustments on me at that time. I thought this was very judicious of the Dr. for I was in pain but his goal was to calm that nerve down and get the blood flowing through the disc. His examination led to this type of treatment. I highly recommend Dr. Bock for any and all Chiropractic needs. I have gone to Chiropractors most of my adult life. I stopped because all they wanted was for me to return for treatments. I stopped because I realized they were not wanting me well, only the money. Pleasantly, to my surprise, he was unlike any Chiropractor I had ever gone to except one. The only thing Dr. Bock wanted was for me to be well. I was so excited to have someone of whom was not just after the money. 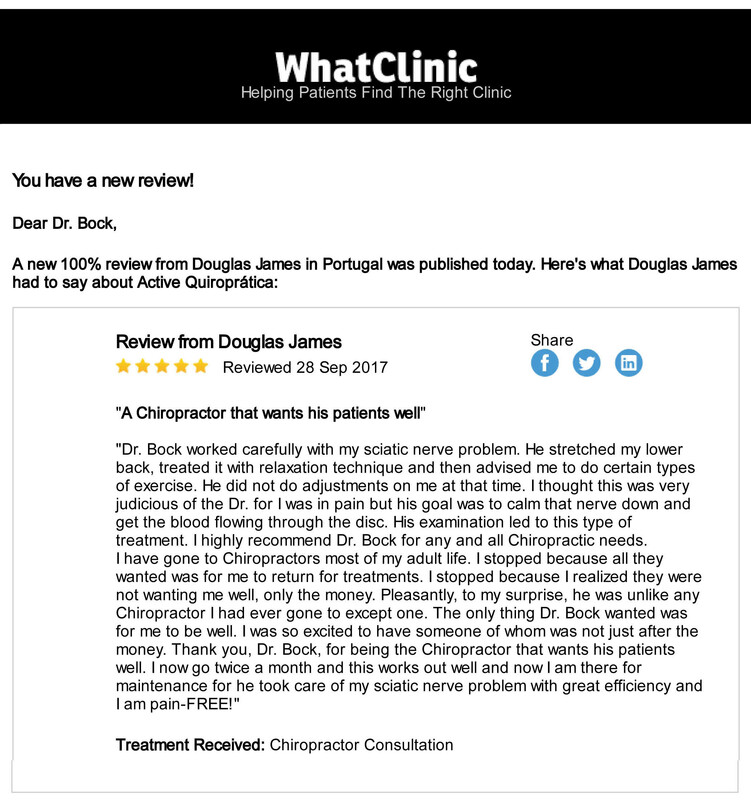 Thank you, Dr. Bock, for being the Chiropractor that wants his patients well. I now go twice a month and this works out well and now I am there for maintenance for he took care of my sciatic nerve problem with great efficiency and I am pain-FREE!" Dr. Chris Ford sold his practices to Dr. Bock in 2013: of Family Medical Centre @ Quinta do Lago, and Lagos.